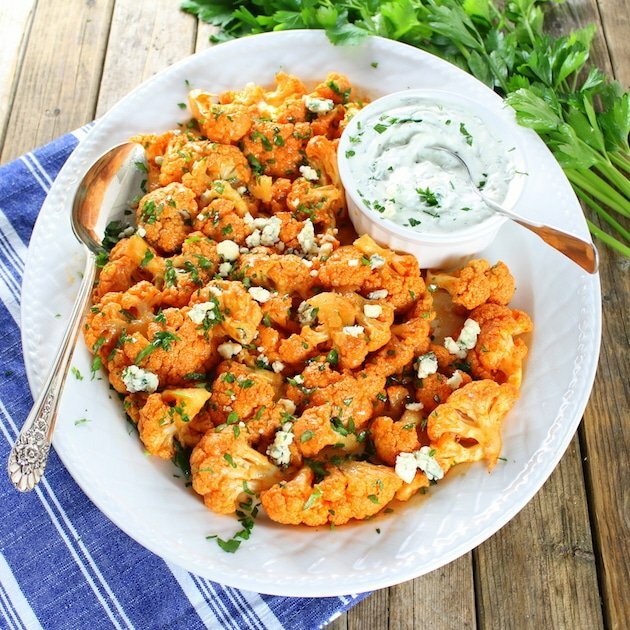 Roasted Buffalo Cauliflower with Blue Cheese Sauce! 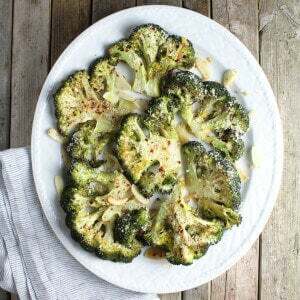 Tons of flavor and a little kick… this low-calorie, low-fat, low-carb veggie that will satisfy the pickiest of eaters. It’s so delicious you’ll forget it’s good for you! I think it all started when he was a toddler and I was a teenager. His family lived in New York State and we would see them a few times a year. He was a huge WWF wrestling fan from a very young age. One time early on they came to visit, and we would “wrestle” together, WWF-style. Basically I would fall on the ground, he would pin me (I use that term loosely), and then count to 3. Then we would do it over and over again. Yep – hook, line and sinker… I won his heart and he won mine.? 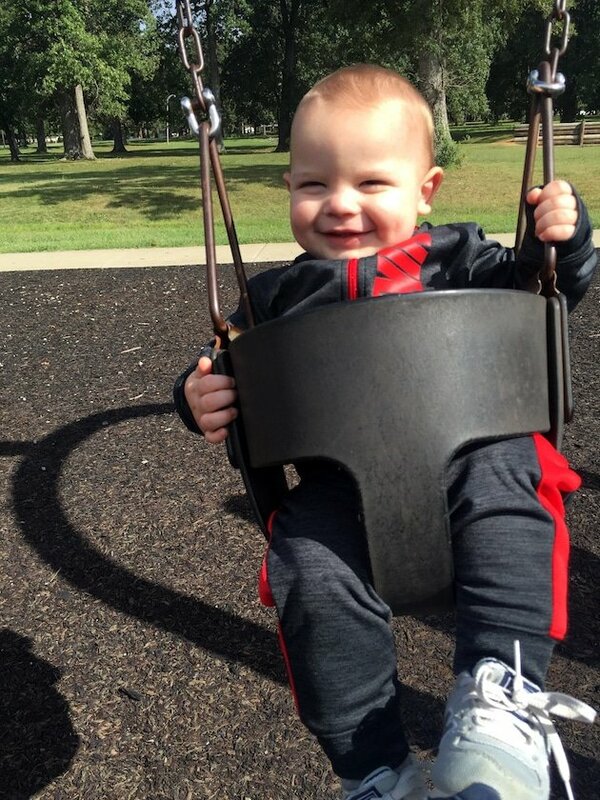 He was such a sweet little guy – always smiling or laughing, full of joy. My sister would tell me stories of him wearing a pair of jeans I bought him every day. He wouldn’t take them off; he even slept in them. She would have to wait for him to go to sleep to even wash them! He would also carry my picture with him wherever he would go. He would show it to random strangers in the grocery store and tell them “this is the one I love.” Swoonapooloza!? Like I said – we had a connection. Twenty some years later we’re still best buds living many miles apart. 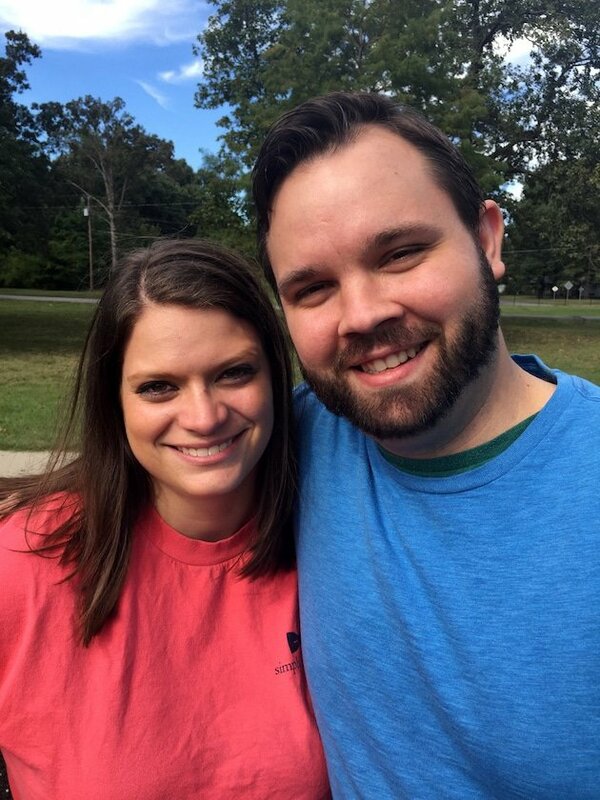 He’s still my sweetie… laid back, kind-hearted, thoughtful, crazy smart, and so much fun to be around. We have a lot of the same thoughts and tendencies. So much so we wonder if we were possibly twins separated at birth, then distanced by time warp.? Although we don’t see each other that often I couldn’t be more proud of the man, husband, and father he has become. And yes – there’s a new little sweetie running around.? His name is Jude, and he is pretty dreamy.? 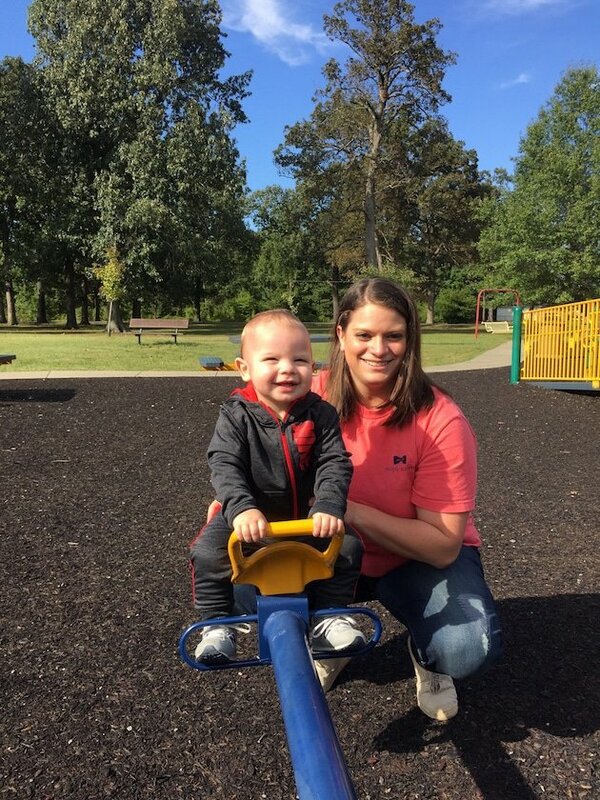 He’s one-year old and he walks, runs, reads books (well sort of), loves to dance to Meghan Trainor, and loves to tickle.? All of the sudden he’s at your side with a huge grin, you feel those little fingers on your arm, and you hear that sweet little voice say “tickle, tickle, tickle.” With perfect articulation. I can’t even. Cuteness overload. Clearly I have no words. At least coherent ones. 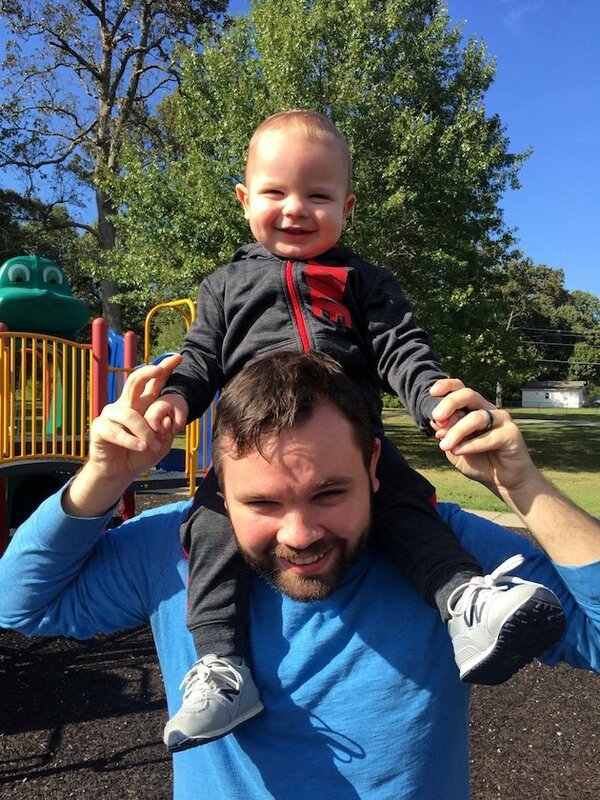 Lest you think Nathan and Jude are the only precious cherubs in this equation, there is one more. 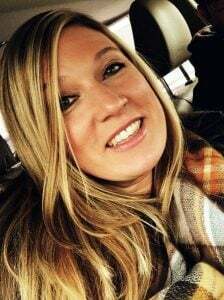 Kayla Shay, KK, Kay Shay, Shaybird, Shayzer (we could be here all day), Kayla is the baby momma in this equation and she is truly special. While we were all sitting around watching sweetie #2 be adorable, we had lots time for catching up and meaningful conversation. And it’s a good thing because today’s recipe was a direct result (you just never know where or when inspiration will strike). 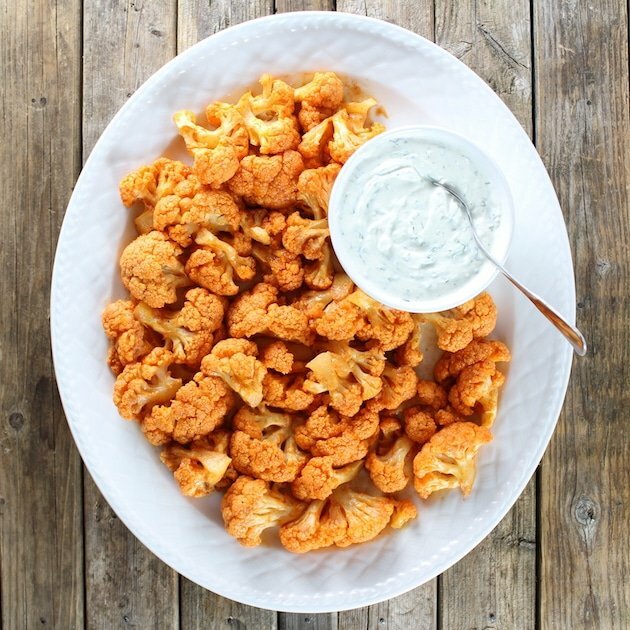 While we were discussing the presidential election, where we should eat dinner, how it was possible for Jude to be so adorable – Nathan mentioned their love of pre-packaged Buffalo Cauliflower Bites. Wait, what?? 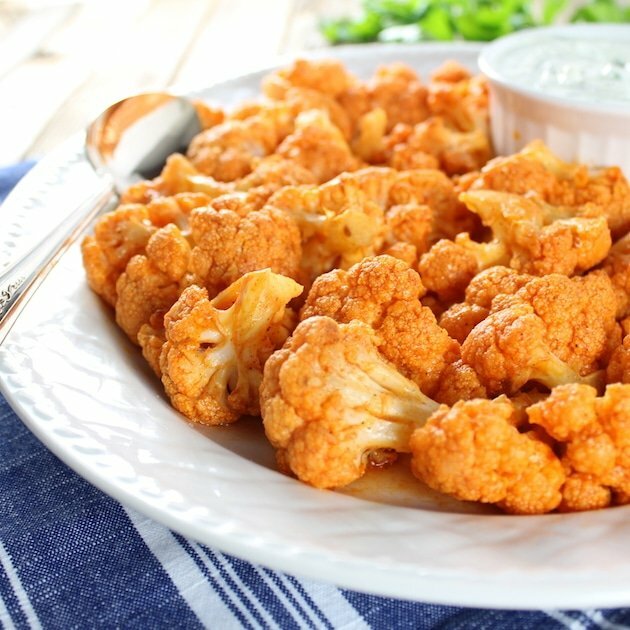 Buffalo Cauliflower!?? Umm – yes that’s happening!?? You know I had to investigate. So in the name of market research, we found the pre-made frozen version from our grocery store. 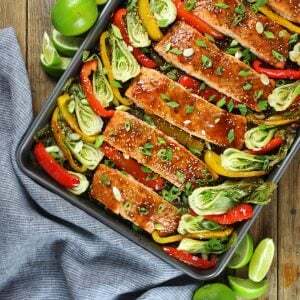 I couldn’t quite do justice to describing those flavors, but let’s just say I was certainly inspired to create my own rendition.? 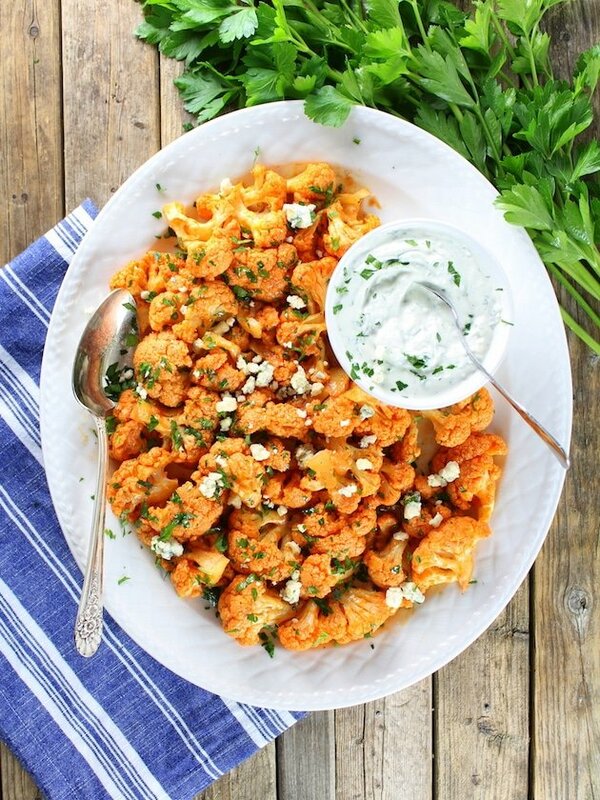 So I went to work and came up with this tasty new veggie dish – Roasted Buffalo Cauliflower with Blue Cheese Sauce!?? 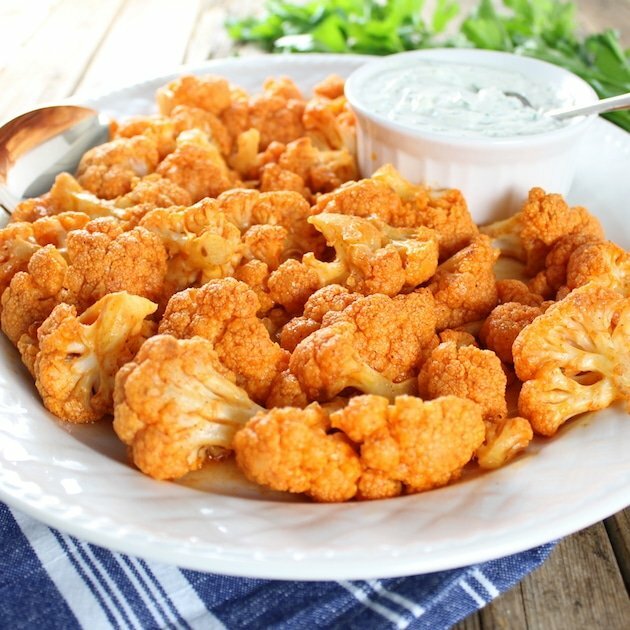 After some experiments with battered and breaded versions (that were way too soggy), I concluded that the best route was baked cauliflower seasoned with buffalo sauce and a side of blue cheese goodness… and I’ll be the first to admit it’s insanely delicious!? 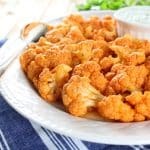 If you can find the 20 minutes, I promise you these cauliflower buffalo bites will knock your socks off!? 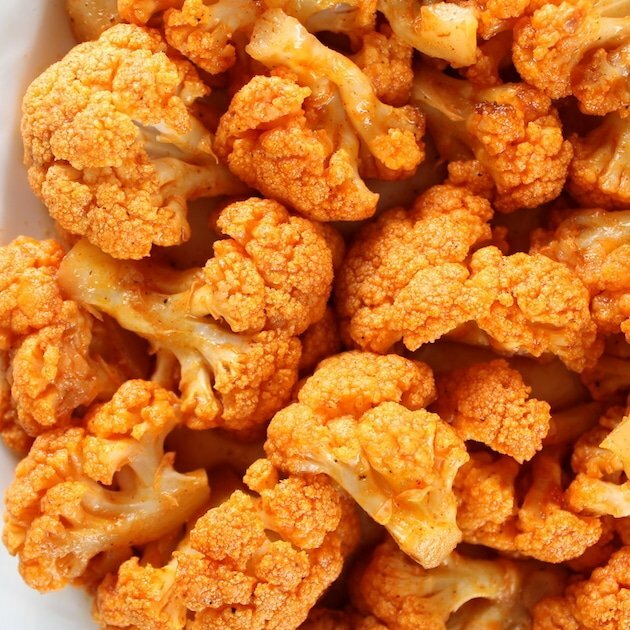 Cauliflower is so hearty you can essentially treat it like meat. And of course we all love buffalo-flavored anything, like these ever-popular Buffalo Chicken Meatballs!✨ And what better pairing than the magical cooling properties of blue cheese sauce? To keep with the healthy buffalo veggie theme, I used low-fat Greek yogurt for the base of my cheesy dip. 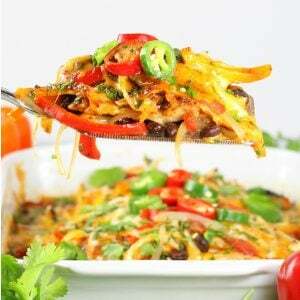 This flavorful veggie creation only takes 20 minutes to put together. 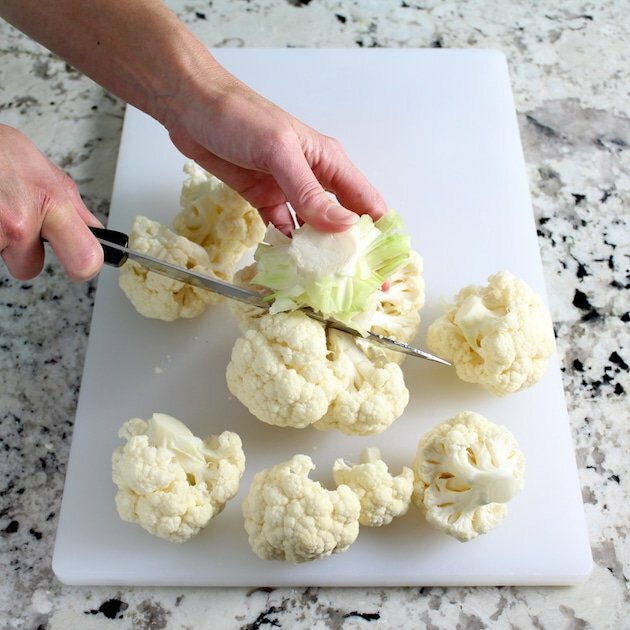 First, break down the head of cauliflower into small florets. 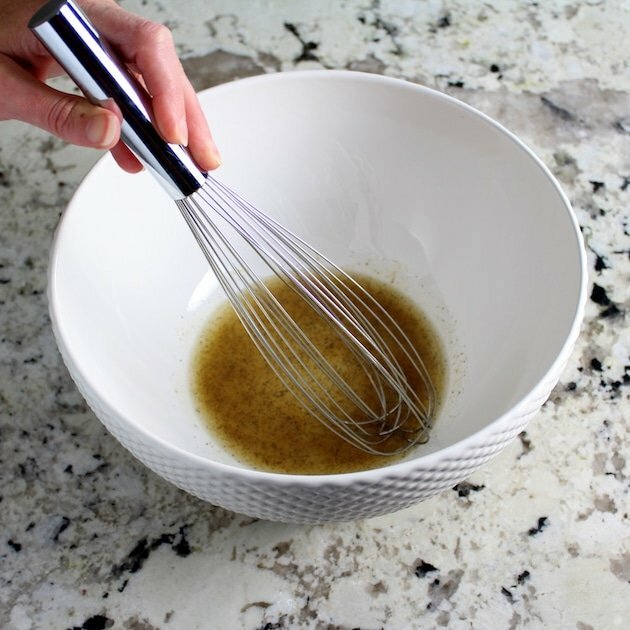 Whisk together olive oil, garlic powder, salt & pepper, then add the florets, stir and coat them thoroughly. 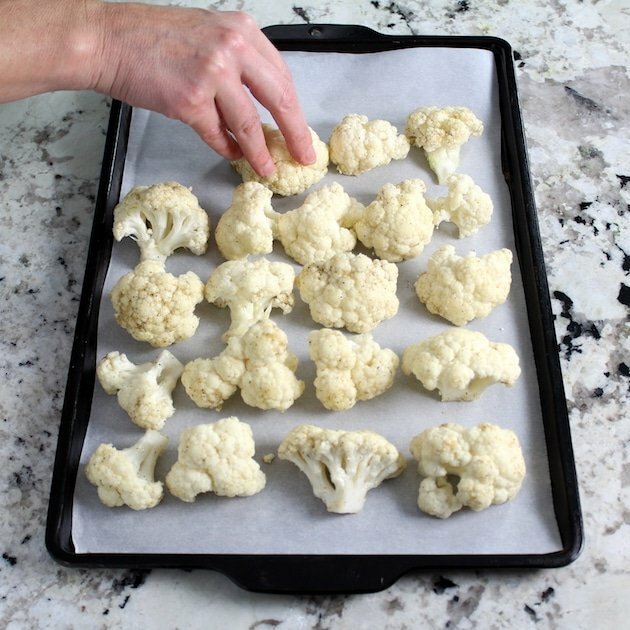 Then roast them on a parchment-lined baking sheet for 15 minutes at 450 degrees. In the meantime, get your Buffalo and your blue cheese sauces going. For the Buffalo sauce, I used Frank’s Hot Sauce, lemon juice and a small amount of butter. If you want to make them 5-alarm hot, use Tabasco instead of Frank’s.?? 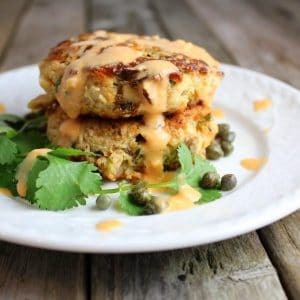 For the healthier blue cheese sauce, throw together some low-fat Greek yogurt, mix in 1 ounce of melted blue cheese (crumble in more for texture), hit it with lemon juice, salt, a tablespoon of milk, and fresh chopped parsley. 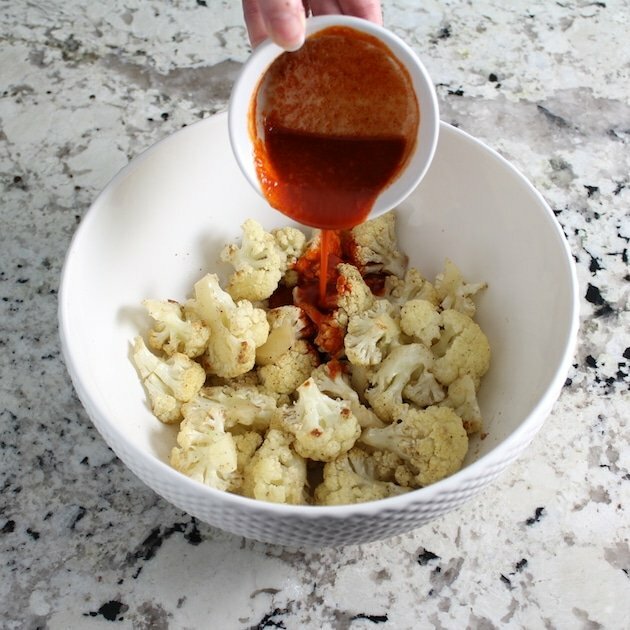 When the cauliflower is finished baking, toss with the Buffalo sauce and serve. BOOM!? Tailgating never tasted so good! My gift to you – a super-healthy replacement for those hot wings – all the flavor with a fraction of the calories! 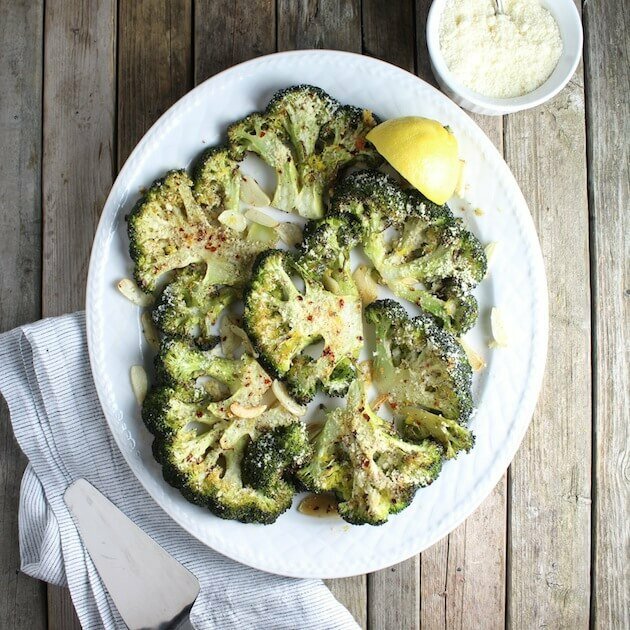 If you’re looking for a great dinner plan, pair these with my amazing Parmesan crusted chicken recipe, and for even more zip add some balsamic glazed brussels sprouts too! 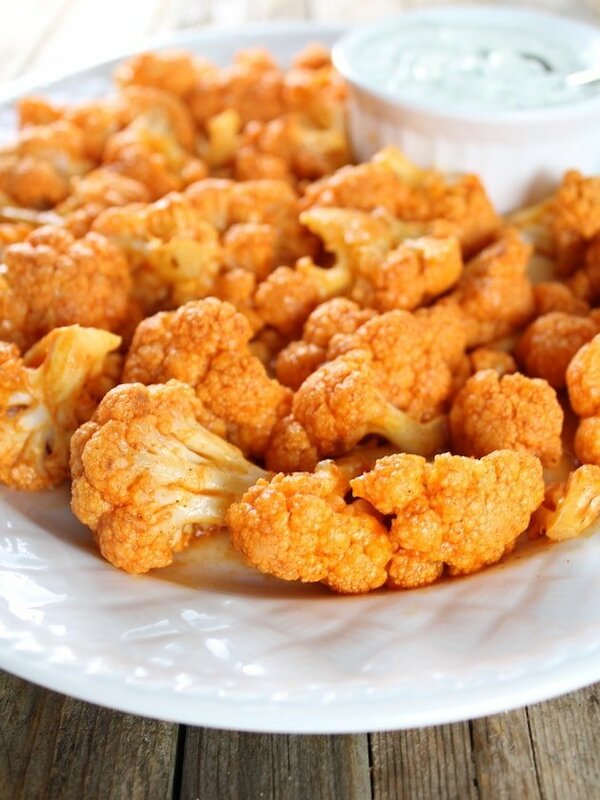 Tons of flavor & a little kick; low-calorie, low-fat, low-carb veggie winner for the pickiest of eaters. 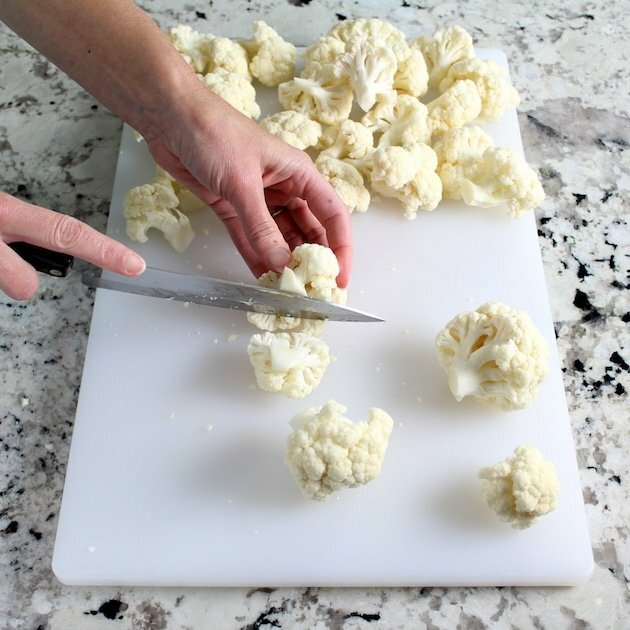 Using a sharp knife, carefully break down the head of cauliflower into small florets. 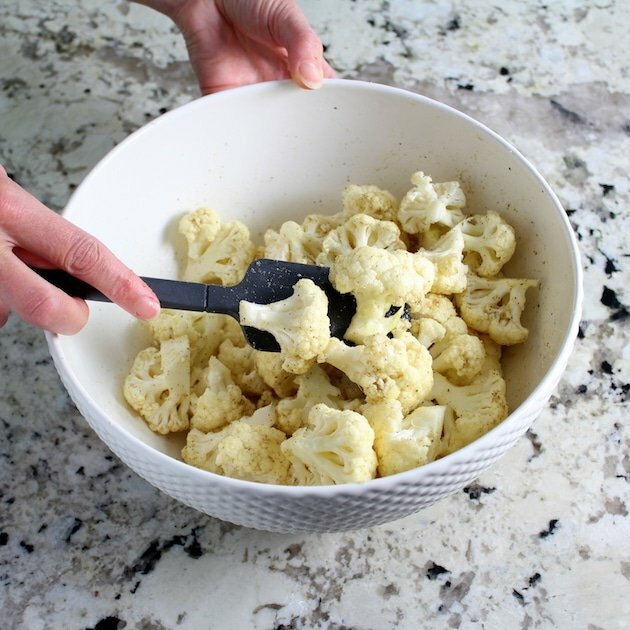 In a large bowl, whisk together olive oil, garlic powder, salt & pepper, then add the florets. 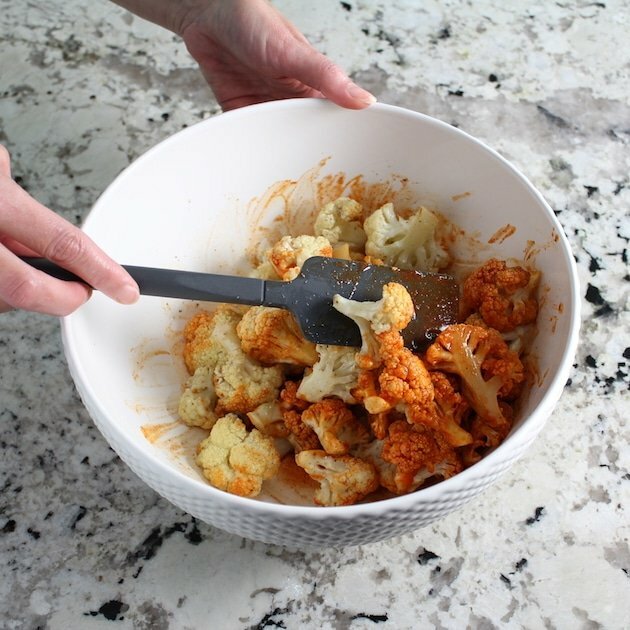 Stir and coat the cauliflower thoroughly. 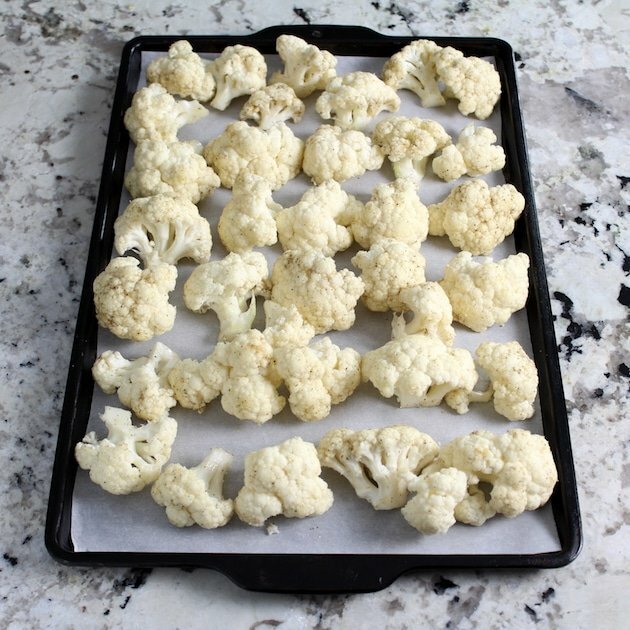 Roast the cauliflower on a parchment-lined baking sheet for 15 minutes. Meanwhile, for the buffalo sauce combine Frank’s sauce, lemon juice, and butter. 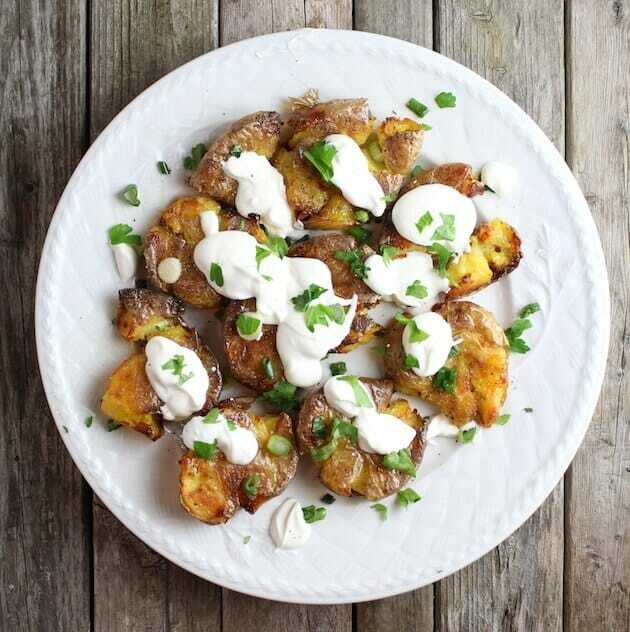 For the blue cheese sauce, melt 2 ounces of blue cheese in a small bowl, then combine with Greek yogurt and mix thoroughly. 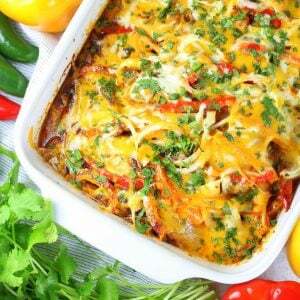 Add lemon juice, salt, milk, and chopped parsley, then incorporate fully. 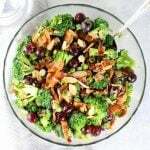 Crumble in 1 additional ounce of blue cheese for texture, and gently mix this into the sauce so the crumbles remain intact. Salt and pepper to taste. 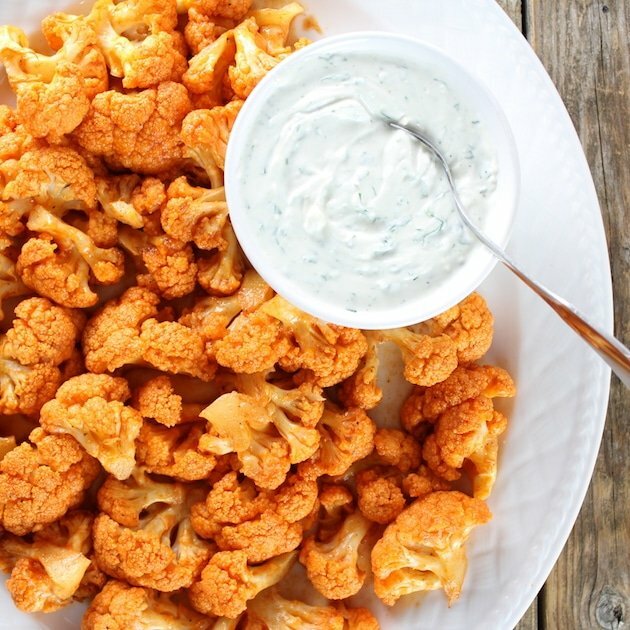 When the cauliflower is finished baking, toss with the buffalo sauce, garnish with 2 more ounces of blue cheese crumbles and chopped parsley, and serve with blue cheese sauce on the side. If you like your Buffalo sauce really hot you could try using Tabasco sauce instead of Frank's RedHot sauce. It definitely has quite a bit more kick. 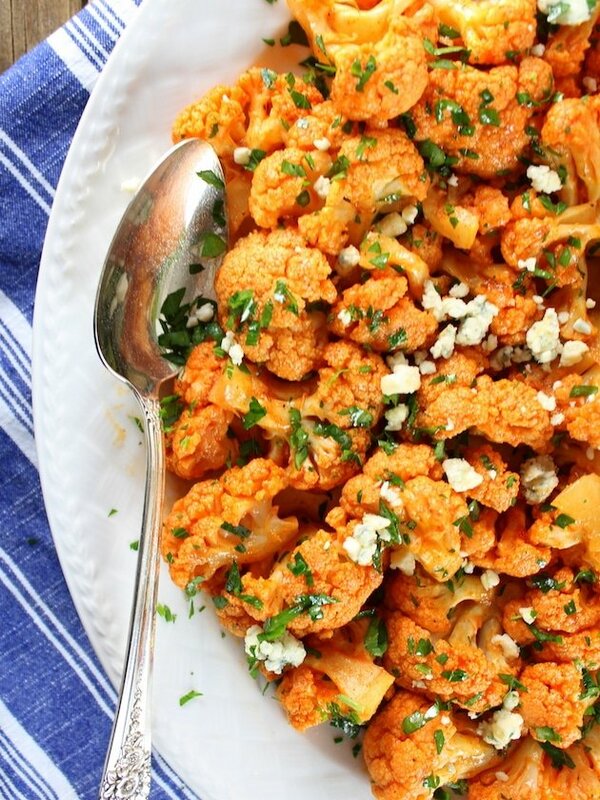 Looking for more amazing veggie ideas? Try these! 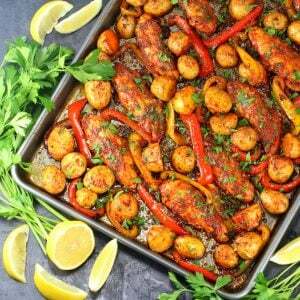 I love this recipe and it was a great alteranative to wings for game day. 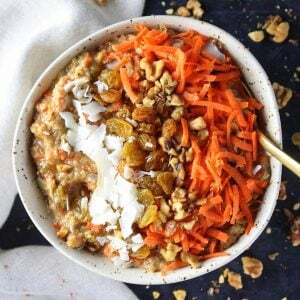 I was wondering if I could share your reciepe on my blog? 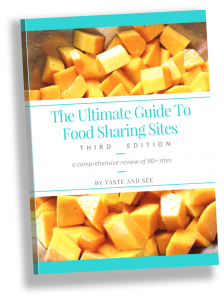 I thought it was great and would to share it with my readers, linking your blog to find the recipe. 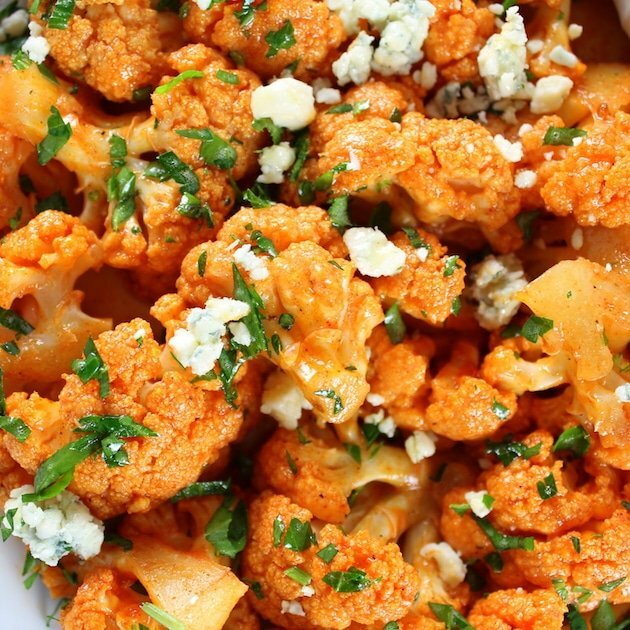 Buffalo sauce on anything is a win!! Going to try this for sure.